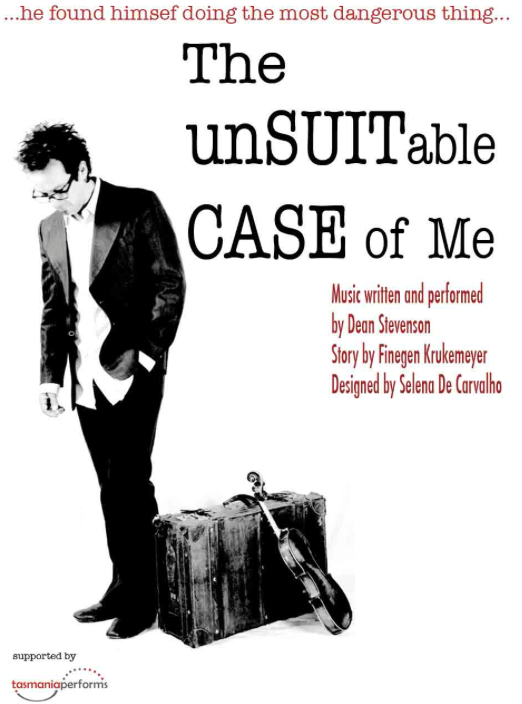 I went to the historic Sorell Memorial Hall on Friday night to see The unSUITable CASE of me, a touring production supported by Tasmania Performs. The music was by Dean Stevenson, an accomplished singer and songwriter who is also a tutor at the Hobart Conservatorium of Music. The story was by Finegan Kruckemeyer a playwright who has had 65 plays produced. So it was with high expectations of a distinguished parentage that I saw this work. The stage was simple, yet effective. As this is a show that is touring around our Apple Isle it is important to have a clean, simple, easily moved set. An uncomfortable chair, a lamp, a few cases here and there; bits and bobs made up the set. Designed by Selena de Carvalho the set succeeded in creating the atmosphere of someone on the edge of a leave-taking. Everything in the play combined to create the idea of a journey. This was the focus of the work. A young man, recently separated from his lover goes out into the world to get back into himself. This allows the hero to move across space and time thinking about his life and the choices he made, or had been made for him. Searching for that impossible moment that can be played again, but differently this time making everything better. The music was performed by a string quartet; Yeun Yum violin, Jeremy Williams viola, Timmothy Osborne cello and Hamish Houston double bass. This was for me the highlight. There is very little I enjoy more than listening to, and watching, a string quartet. The flowing sounds of the strings mesmerise, while it is a feast for the eye to see the various techniques the musicians use to create the range of sound. Striking, bowing, plucking all add to a soundscape that is as much a conversation between the instruments as it is the background for singing. The story itself is a simple one of loss and reconciliation; the hero reconciling with himself and, at the end, meeting her and reconciling the broken relationship. No final conclusion is made as to their reunion and in the best tradition this point is left hanging, allowing the audience to make that determination themselves. As the broken hearted man, Dean Stevenson used his voice and his movements on stage, to show the pain of heart break that most know only too well. In all it reminded me of the album Dark Side of the Moon or Elvis Costello's Imperial Bedroom. This work understands that period of life, usually in the late twenties or early thirties, when one realises that the dreams of childhood will never come to pass. That one will never be an astronaut, nor will one ride off into the sunset with a woman with long red hair. None of us will live happily ever after.